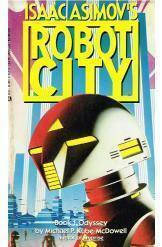 Isaac Asimov's Robot City Odyssey,Michael P. Kube-Mcdowell, 211pgs, book in a good condition, all pages intact. Beyond Aurora is a brave new world...of Robots. Derec, a man without a memory stranded on a cold astroid. To survive Derec teams up with a group of androids who are searching for a mysterious artifact. Their journey together takes them to an amazing city.